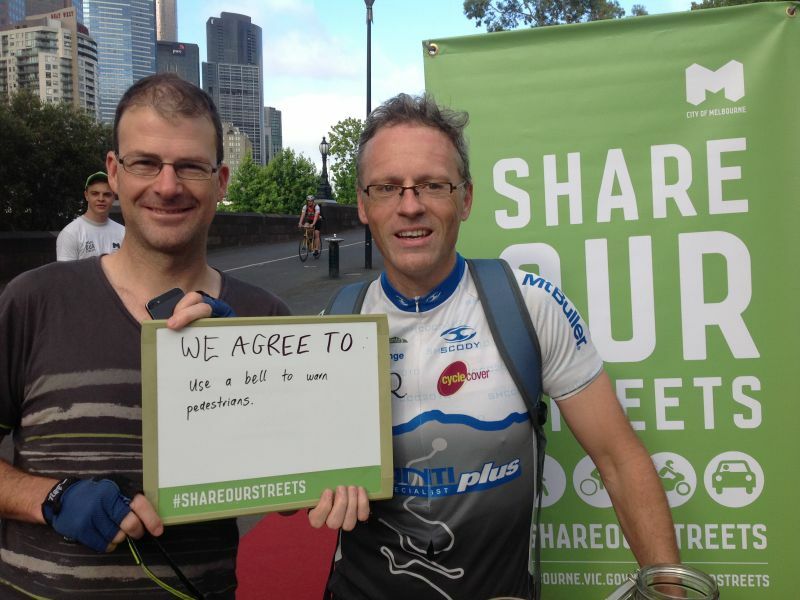 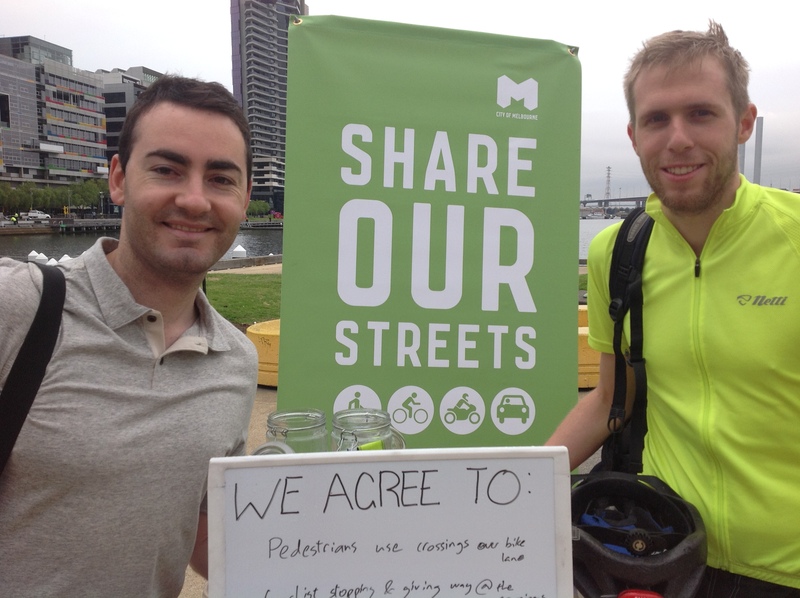 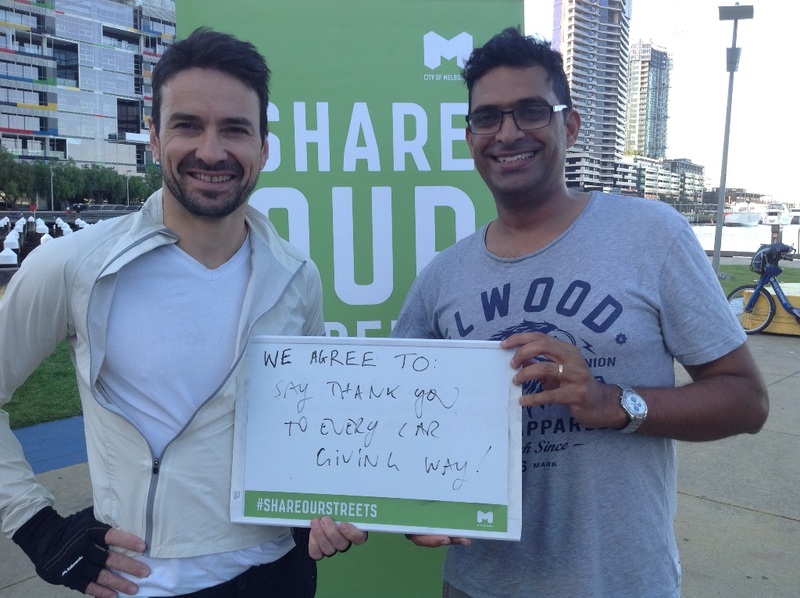 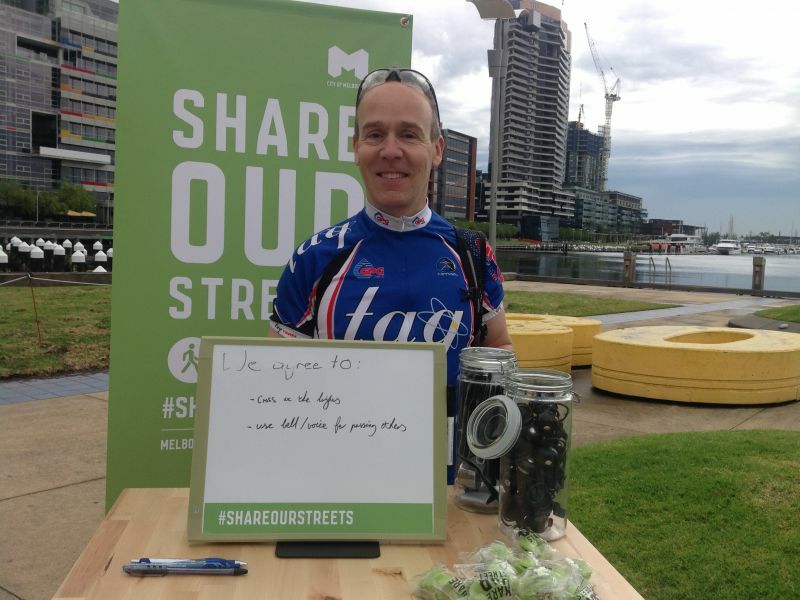 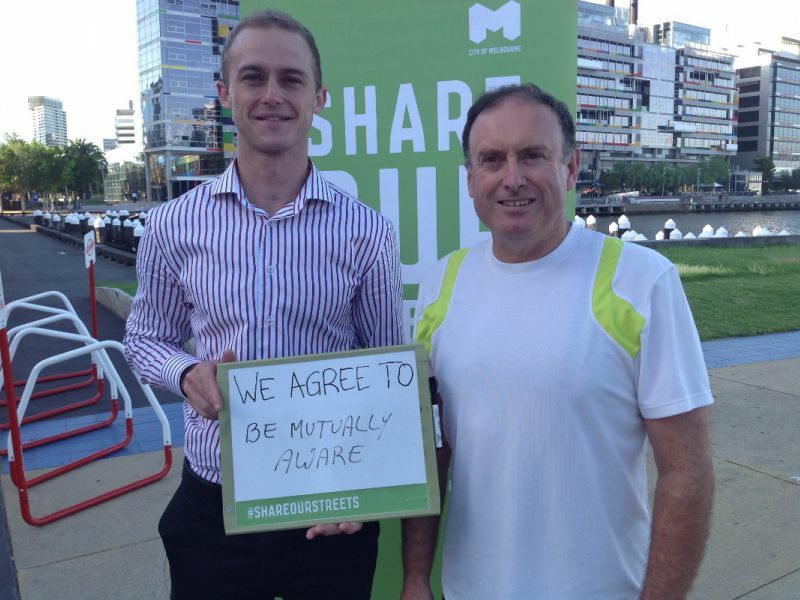 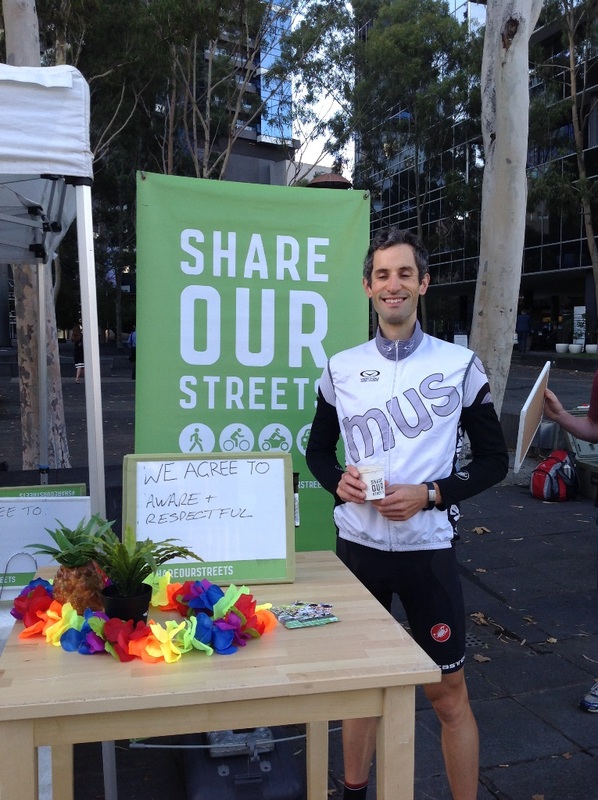 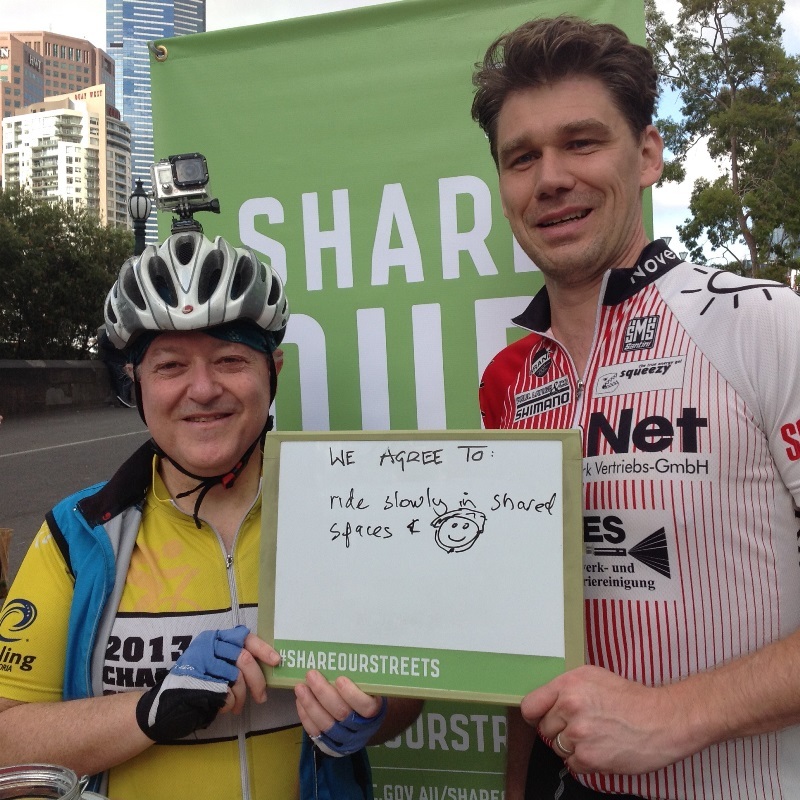 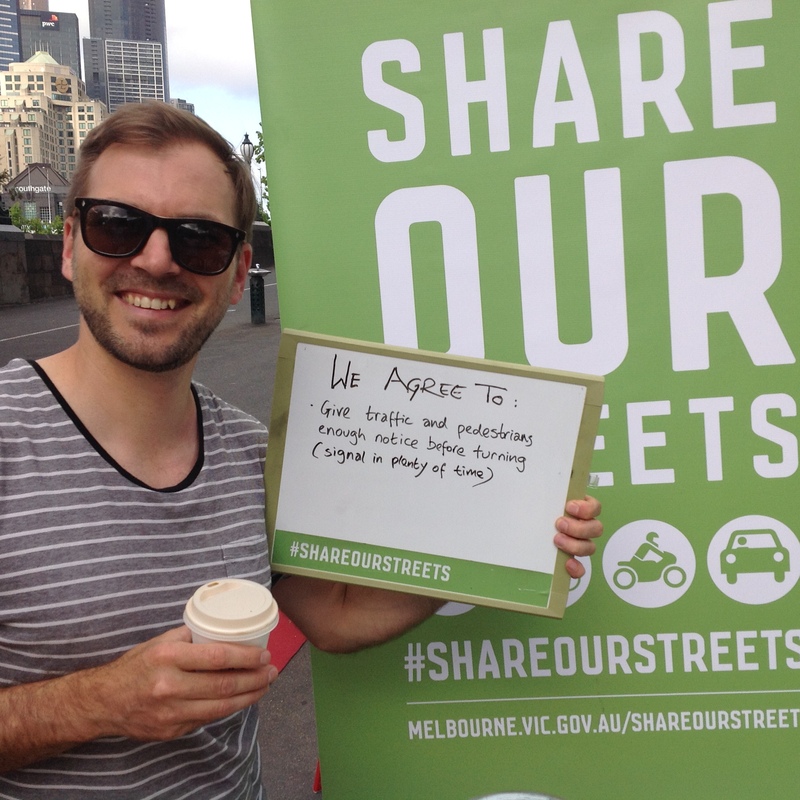 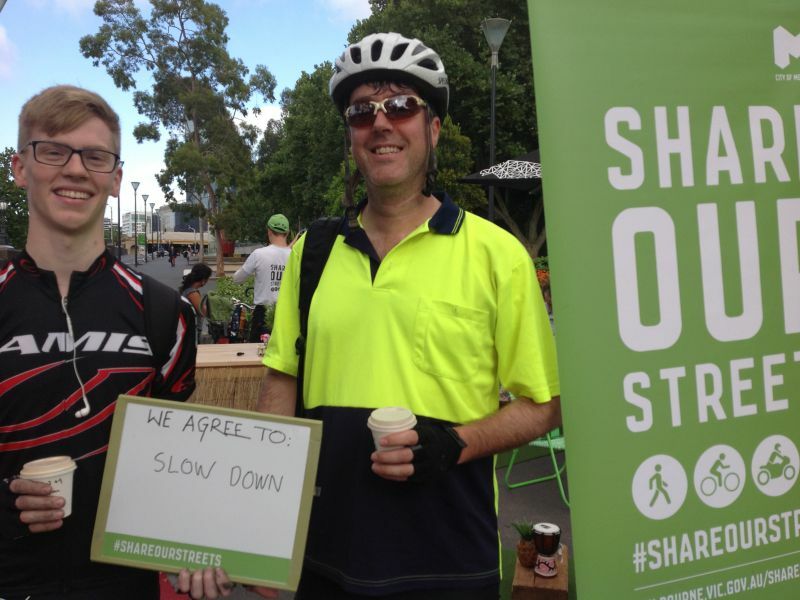 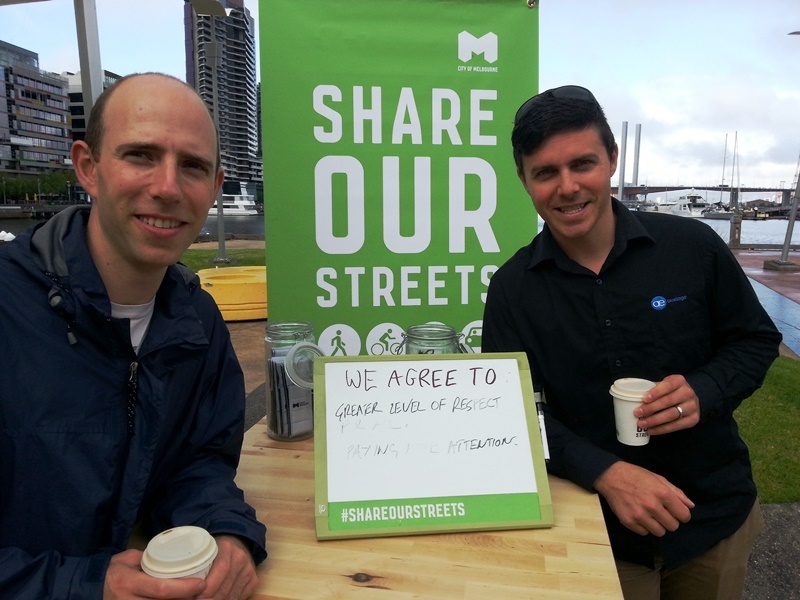 Share our Streets is the City of Melbourne’s way of encouraging road users to show courtesy and respect to make their journey around the city safer and more enjoyable. 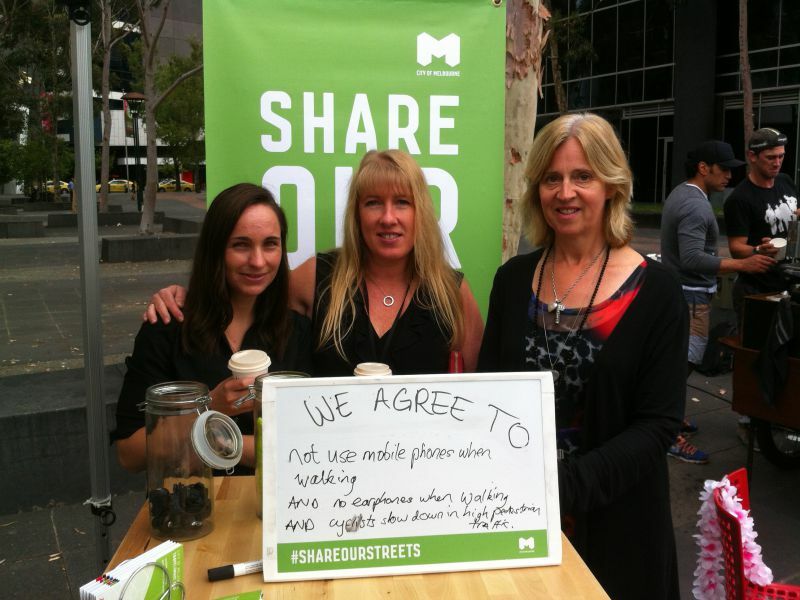 Community engagement for Share our Streets has now closed. 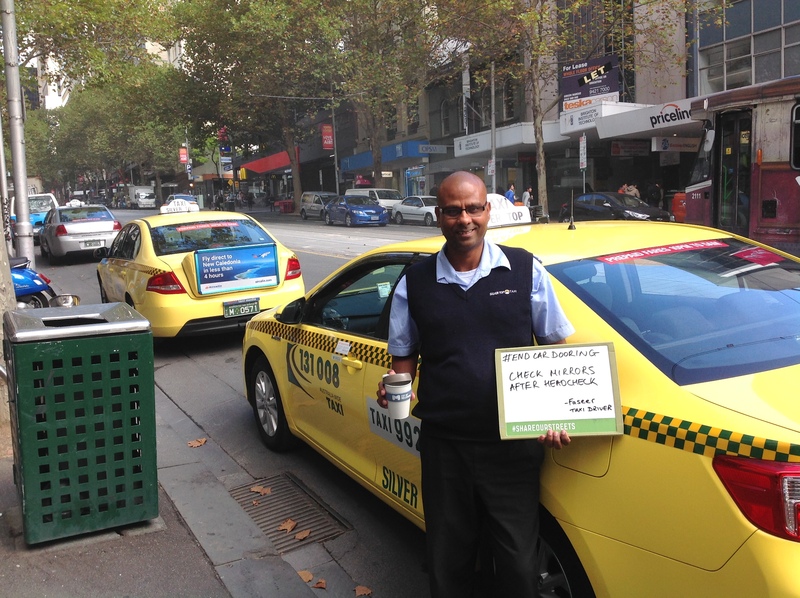 Our street teams have completed their work at high incident locations across the city for now. 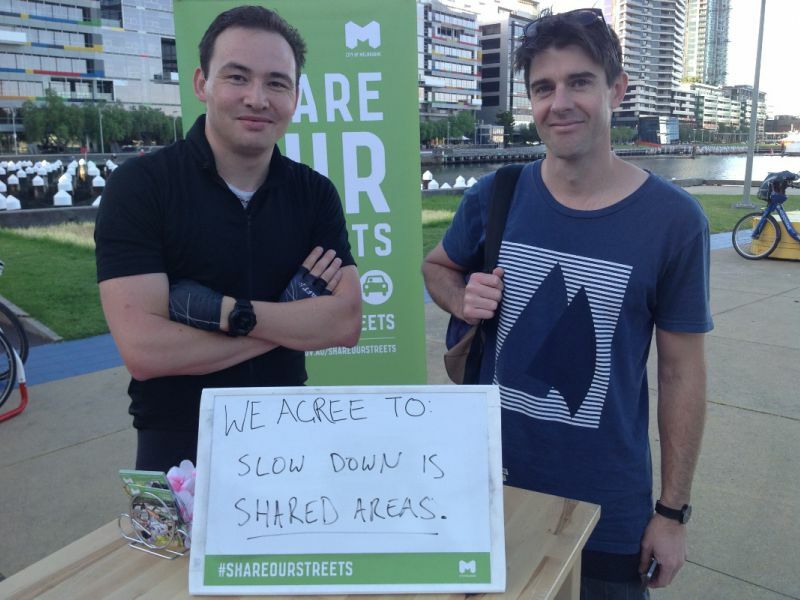 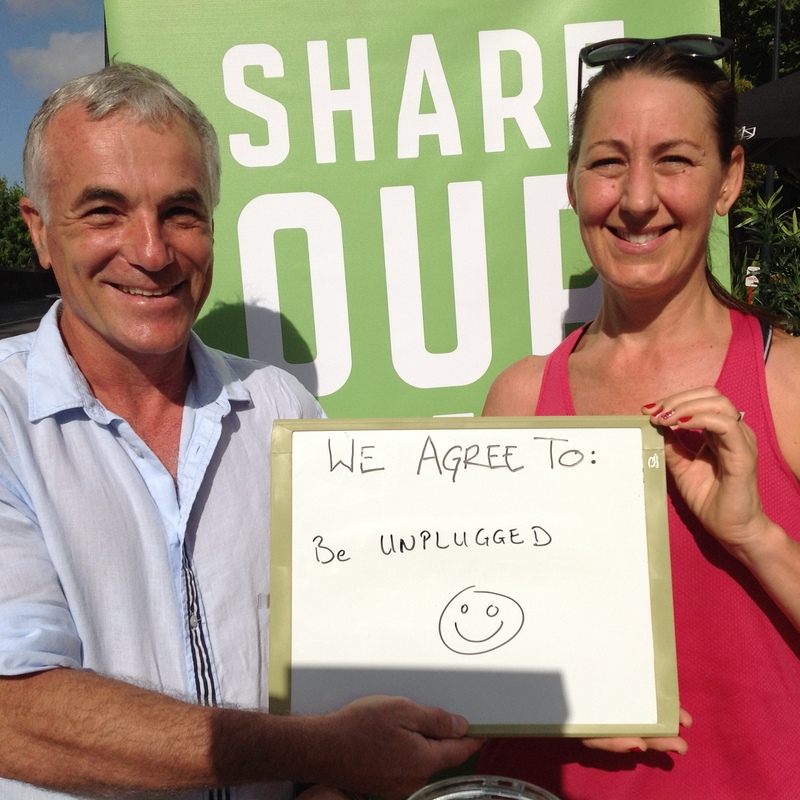 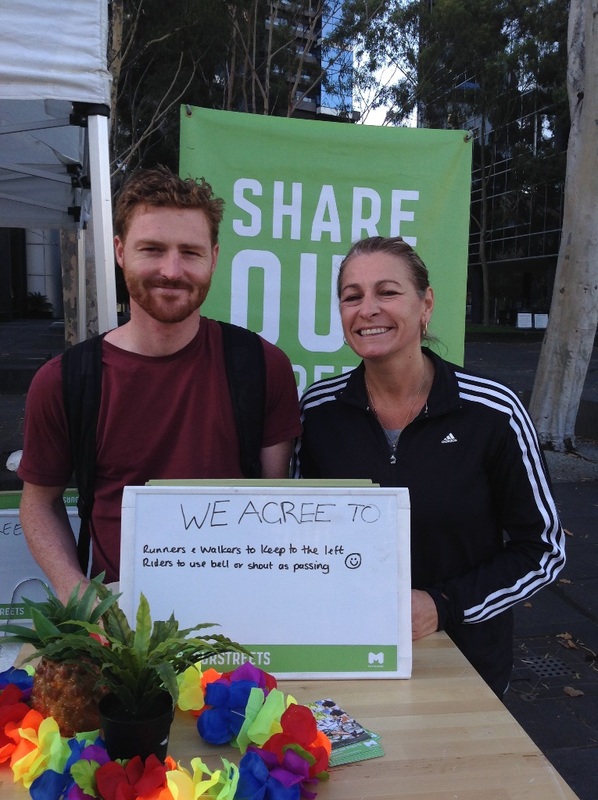 In shared spaces over 900 people pledged to share. 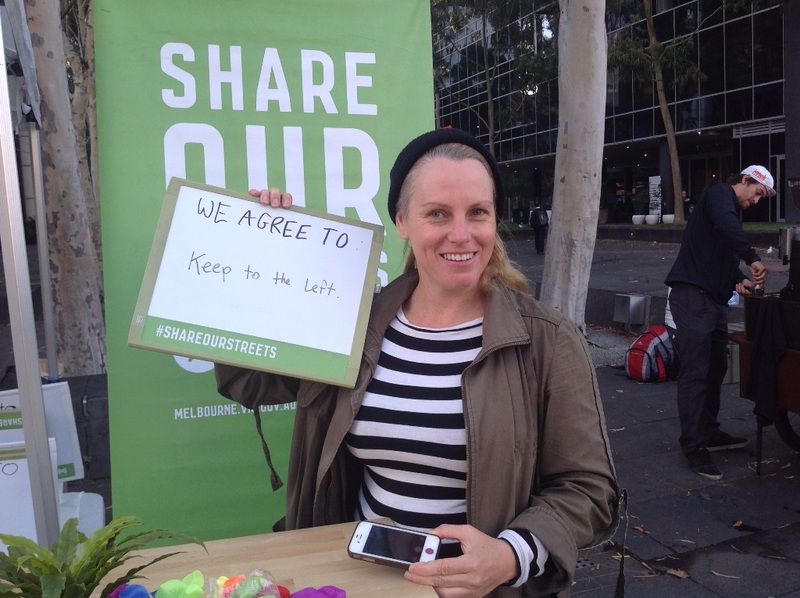 Many people pledged to keep left and be aware of their surroundings, or ride at a more relaxed speed. See more pledges from residents, workers and visitors below. 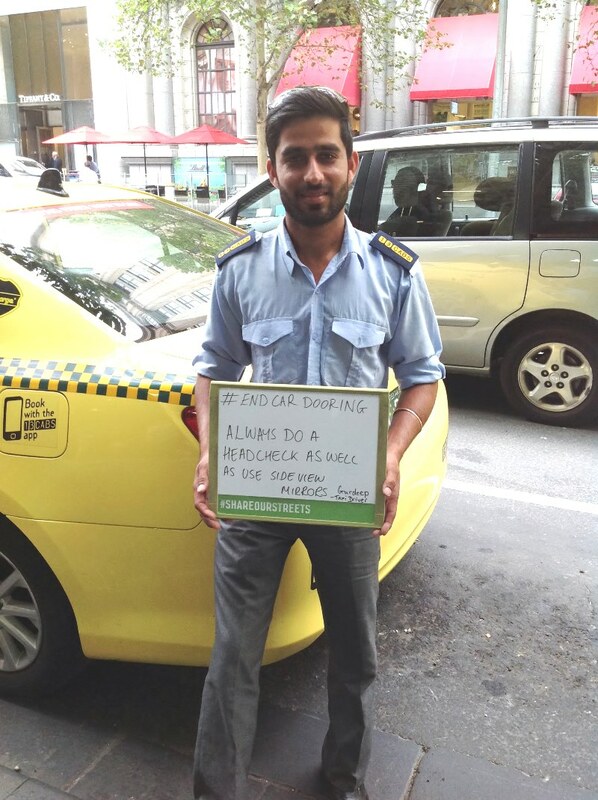 Over 12,000 tip cards were given to people walking across busy intersections in the city, reminding them to look up from their phones and observe signals when crossing city intersections. 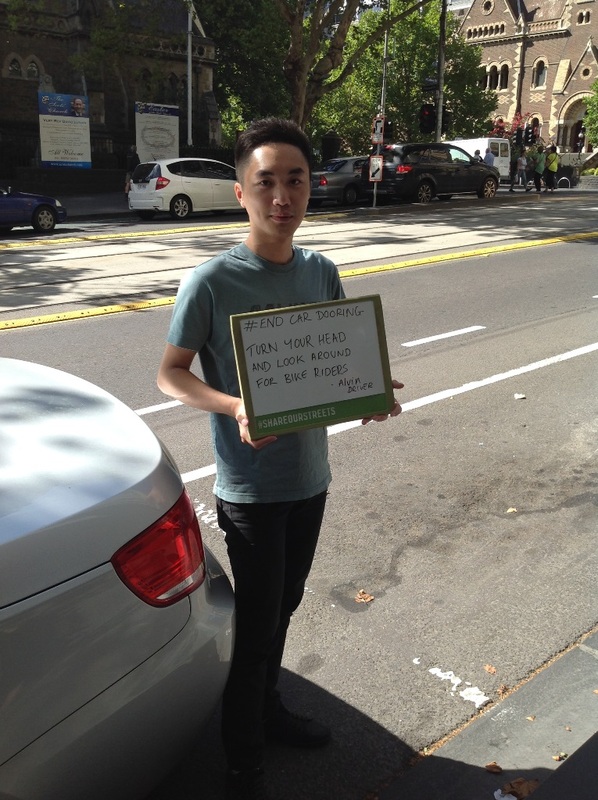 On St Kilda Road and Collins Street we engaged with over 2000 drivers to help them look out for people riding bikes when opening their car door. 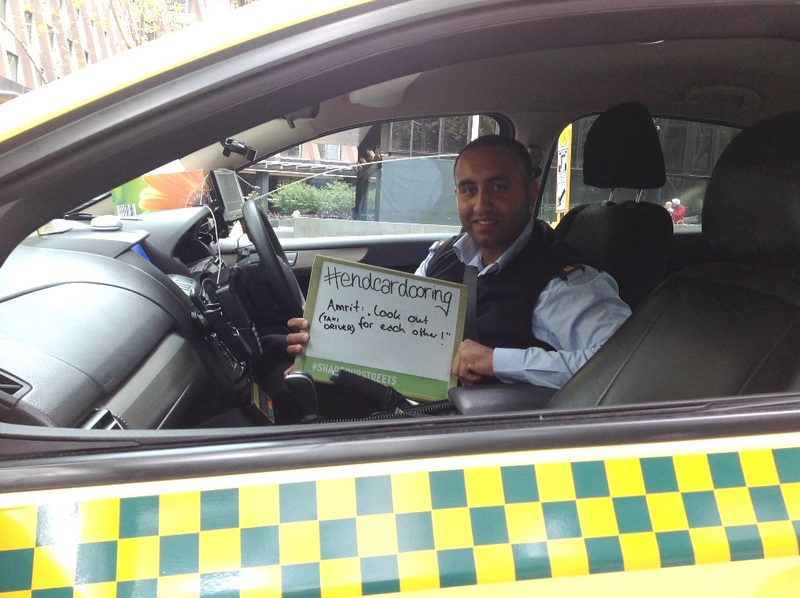 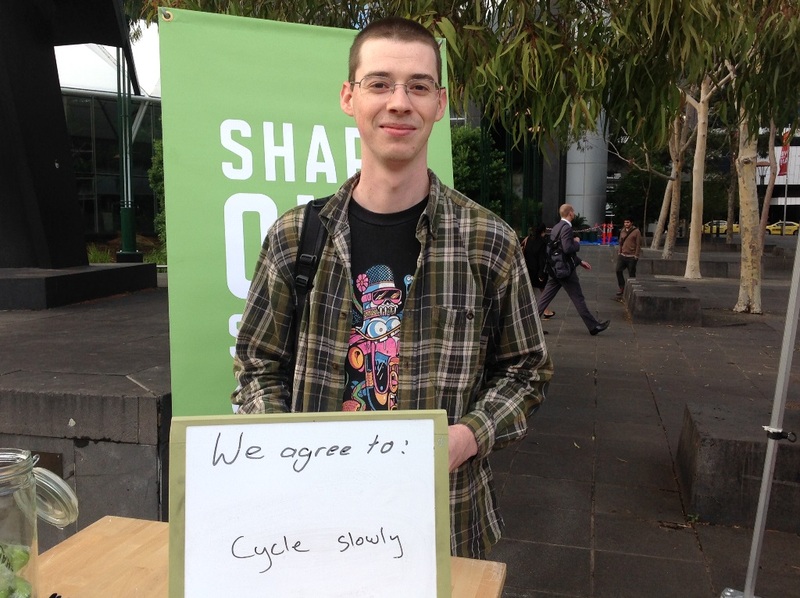 See some photos of pledges to end car-dooring below. 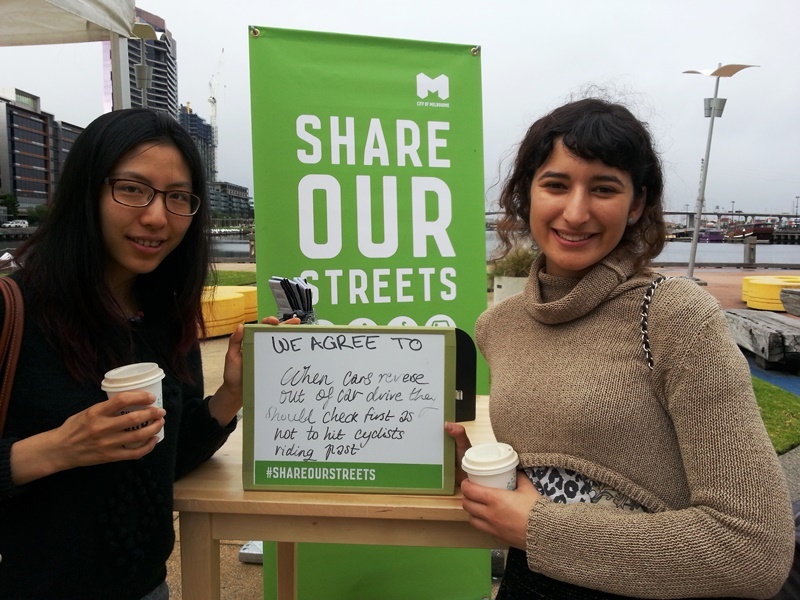 Did you know that around one million people use our streets every day? 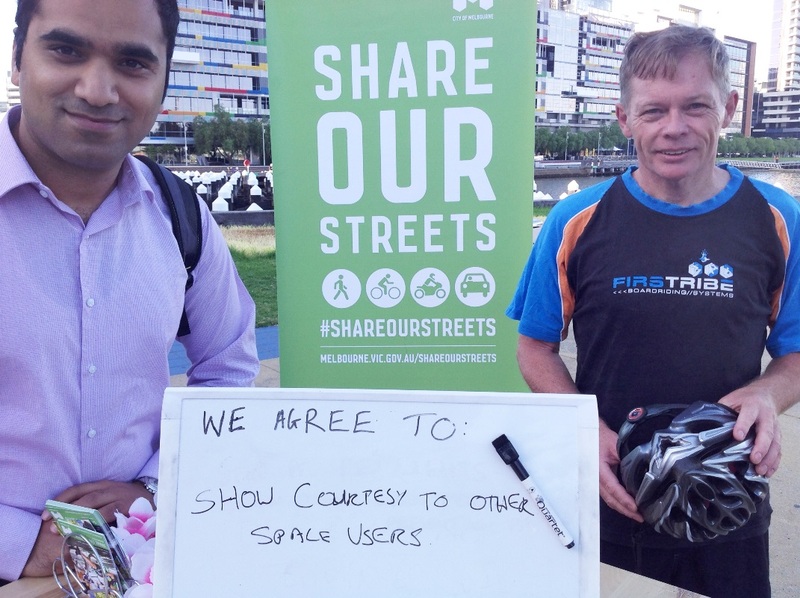 This means you’re sharing public spaces with many others. 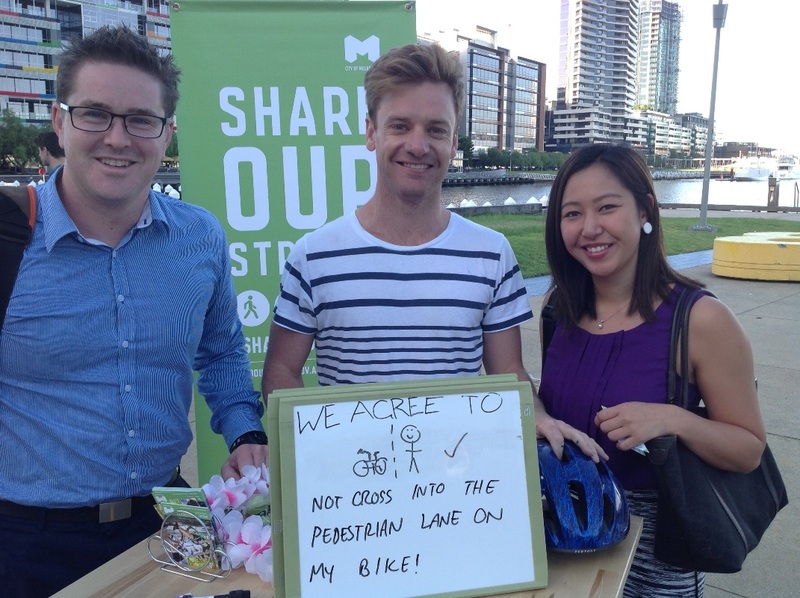 Look out for people riding bikes when you change direction. 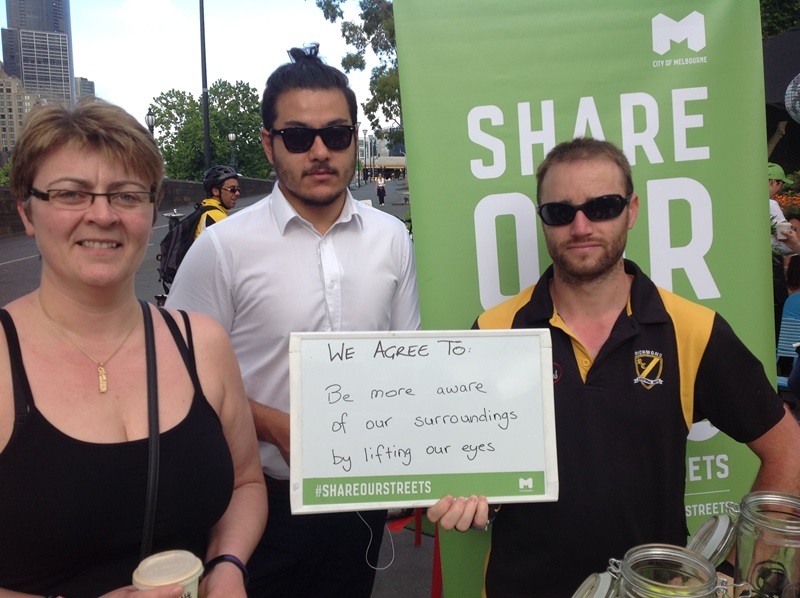 Drop into one of our activities or share your photo and pledge below to make the city safer and more enjoyable for everyone. 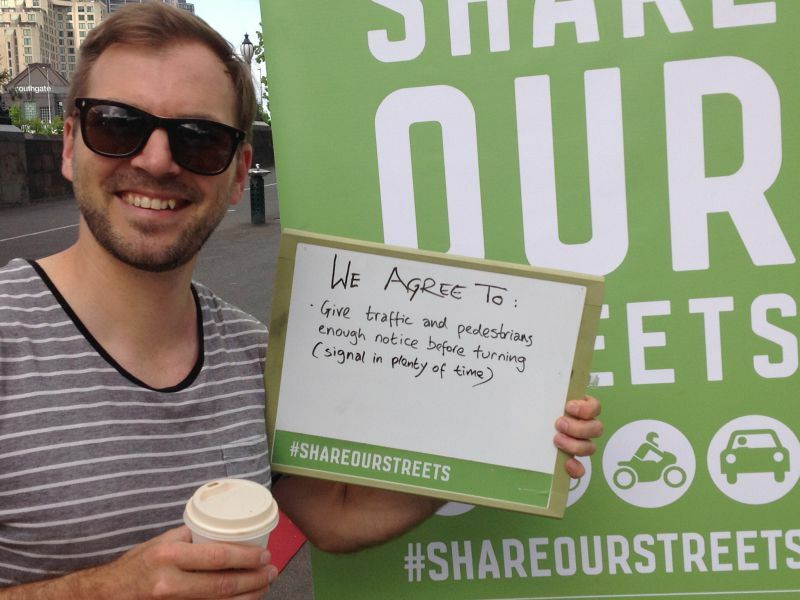 To provide further feedback on Share Our Streets, Road Safety Plan 2013-17 or draft Bicycle Plan 2016-2020 phone 9658 9658 or email engineering@melbourne.vic.gov.au. 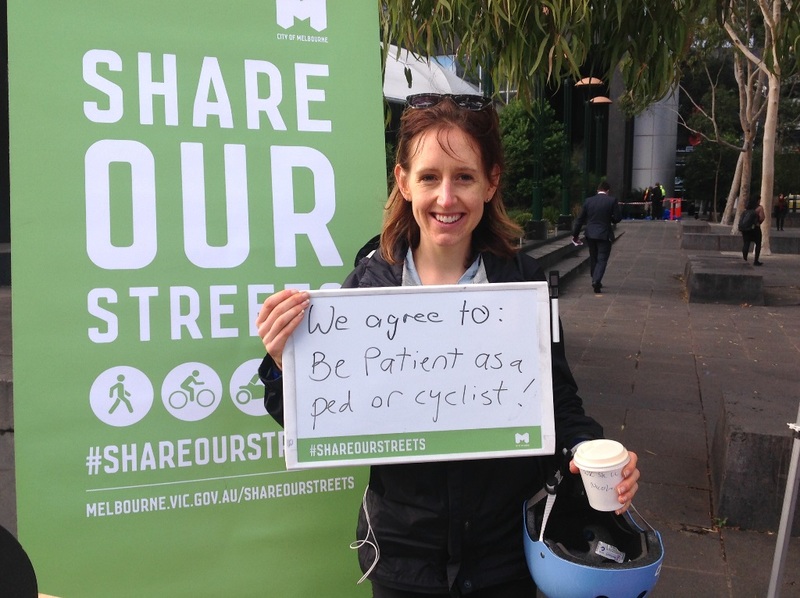 Be patient as a ped or cyclist! 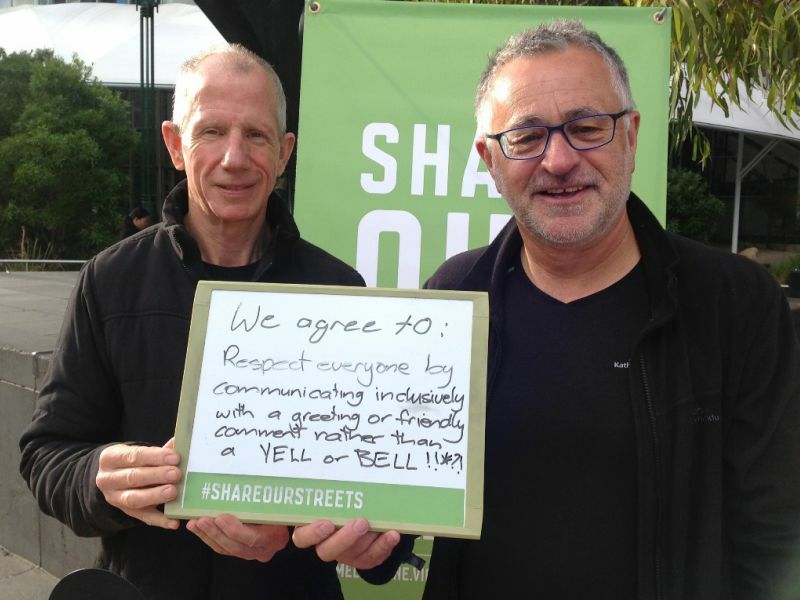 Respect everyone by communicating inclusively with a greeting or friendly comment rather that a YELL or BELL! 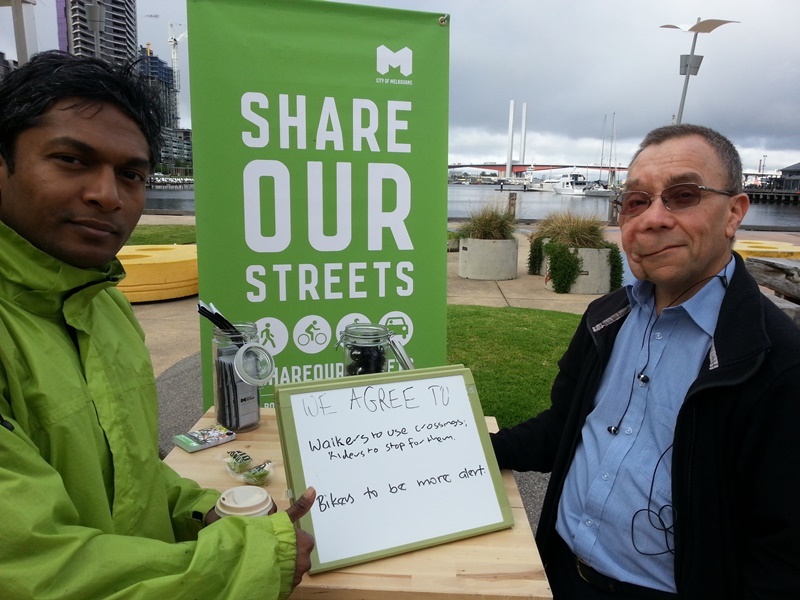 We agree to ask for windbreakers at Docklands, use my bell on the bikepath, not walk on the bike path. 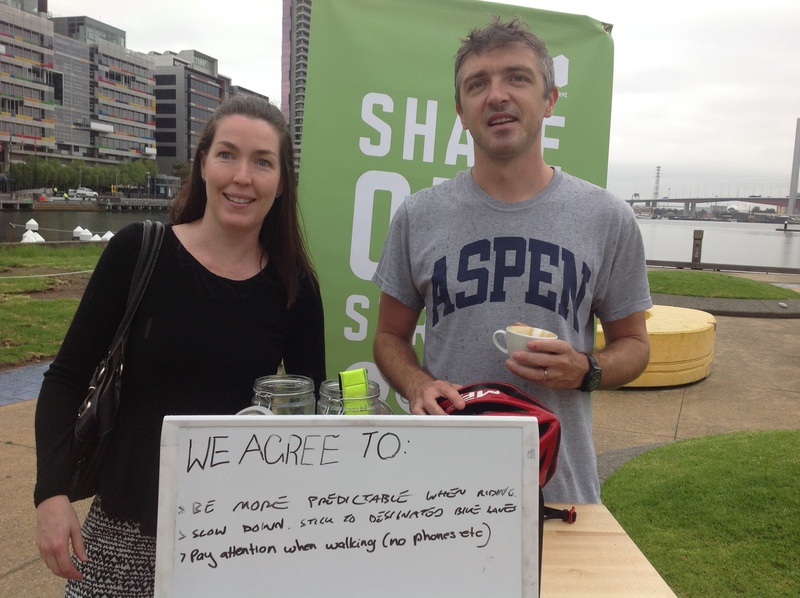 Use more open space. 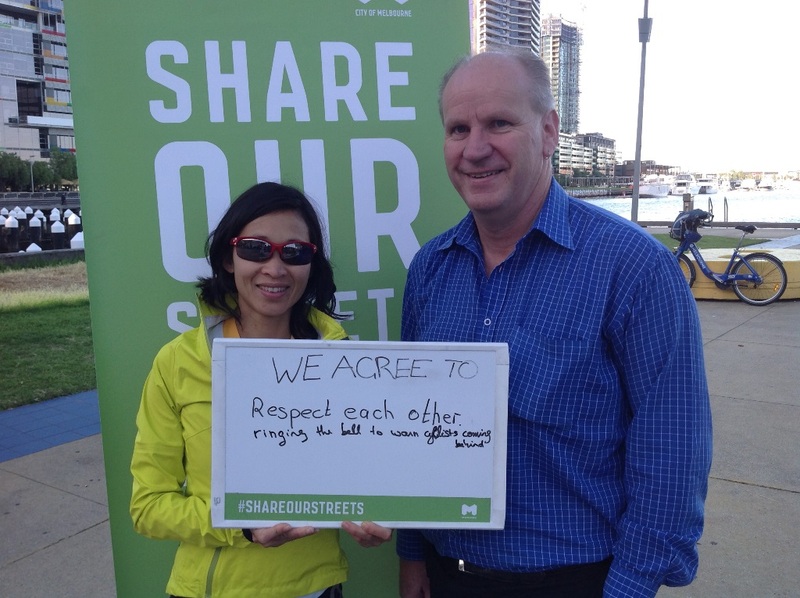 We agree to cross at the lights and use bell/voice for passing others. 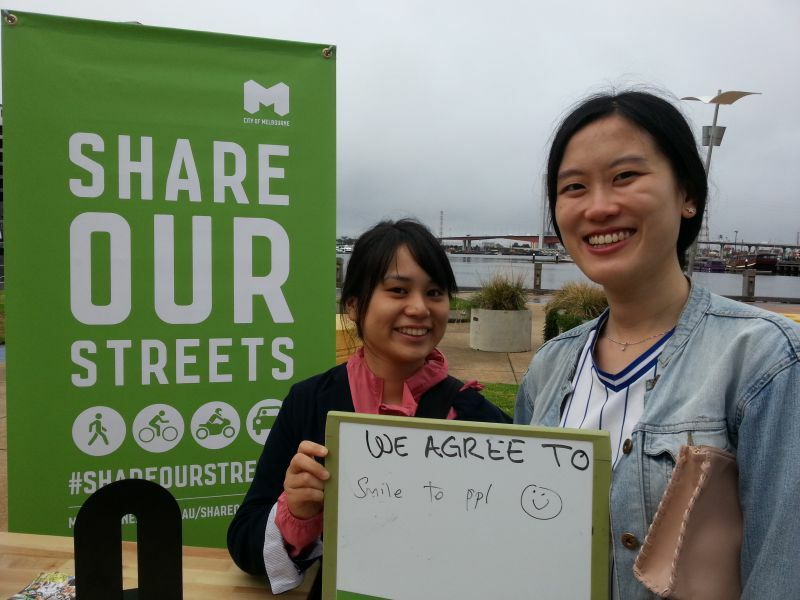 We agree to adhere to traffic rules and willingly and wholeheartedly smile. 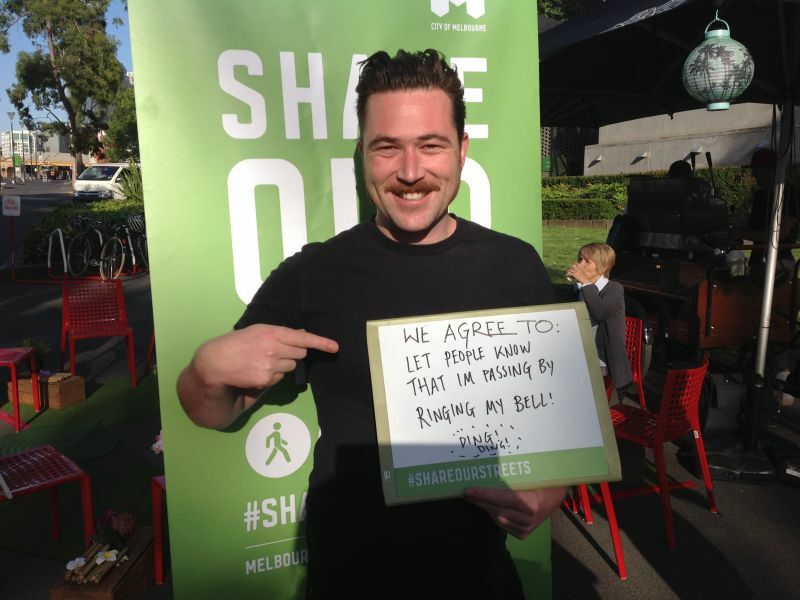 We agree to let people know that I’m passing by ringing my bell! We agree to walkers to use crossings. 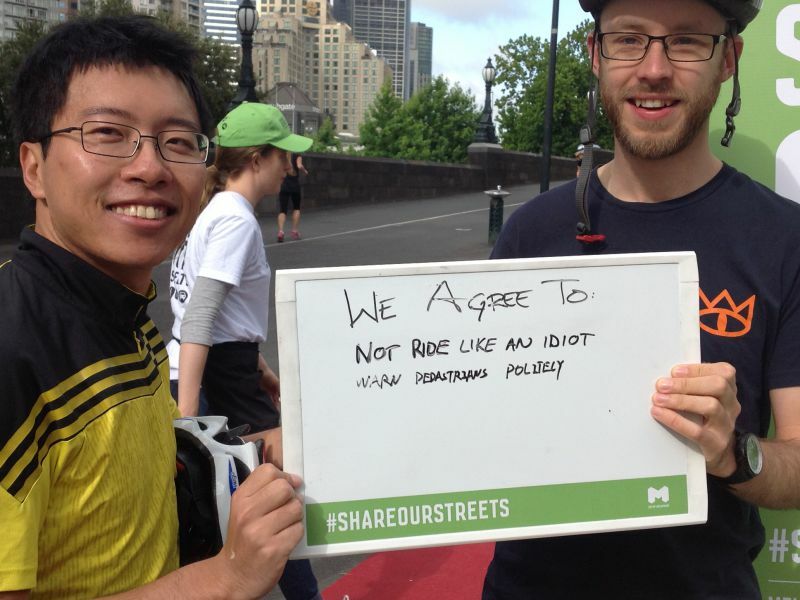 Riders to stop for them. Bikers to be more alert. 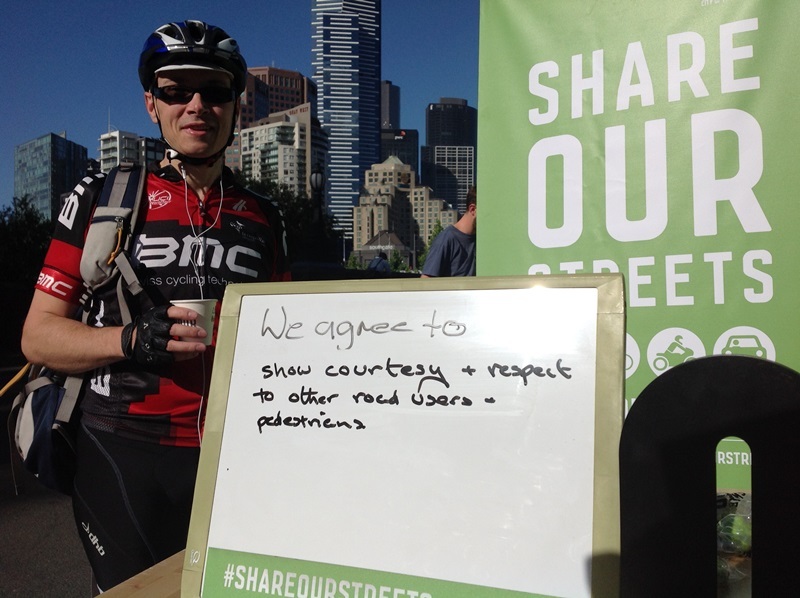 We agree to look where you are going when you change directions. 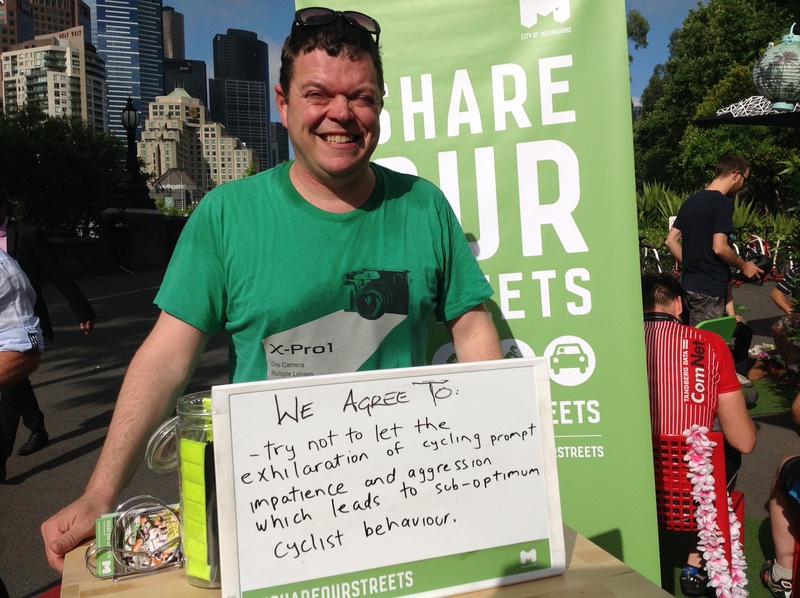 Our streets teams were out and about in March and April communicating about the need to look out for people riding bikes before opening a car door. serious injury or even death if thrown into the path of another vehicle. 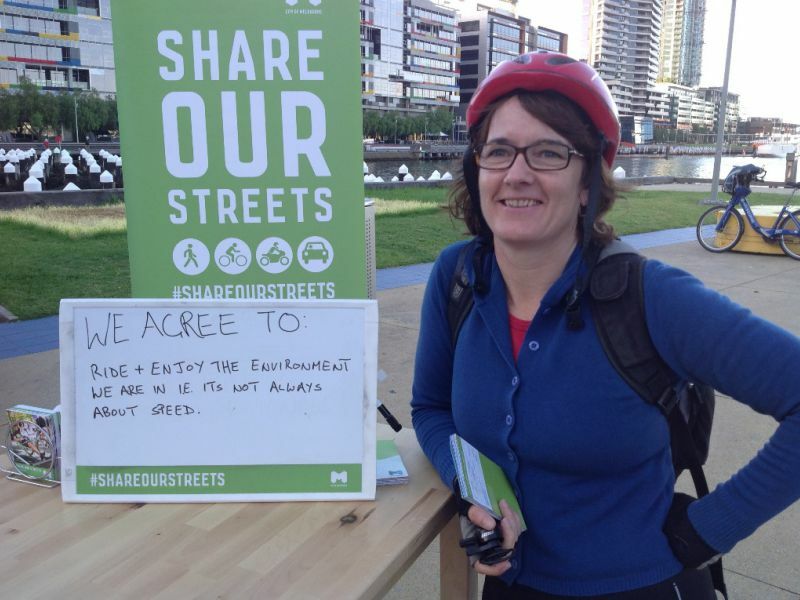 a fine of at least $369 and living with injuring or killing someone. The teams will be roving in high car-dooring crash locations offering to help drivers by sharing the following tips to avoid car-dooring. 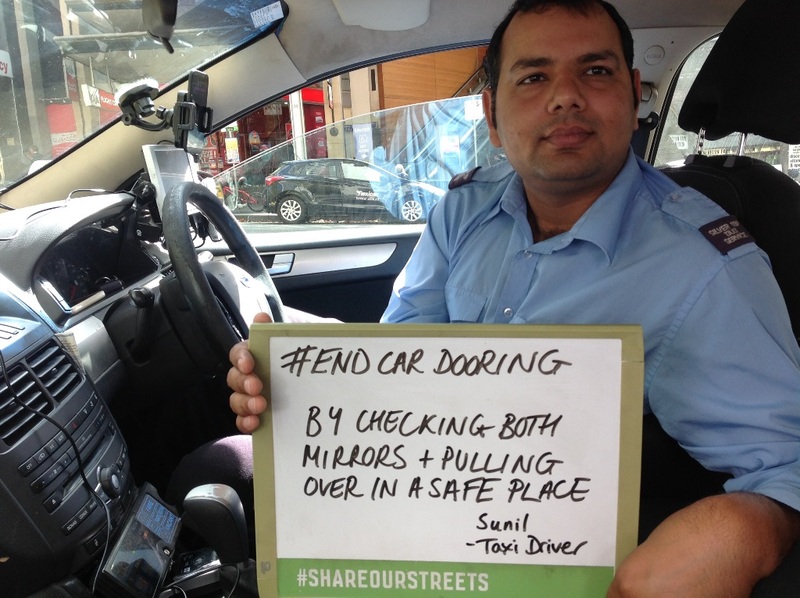 Always use your mirrors before getting out of a vehicle – expect people on bicycles to be passing. 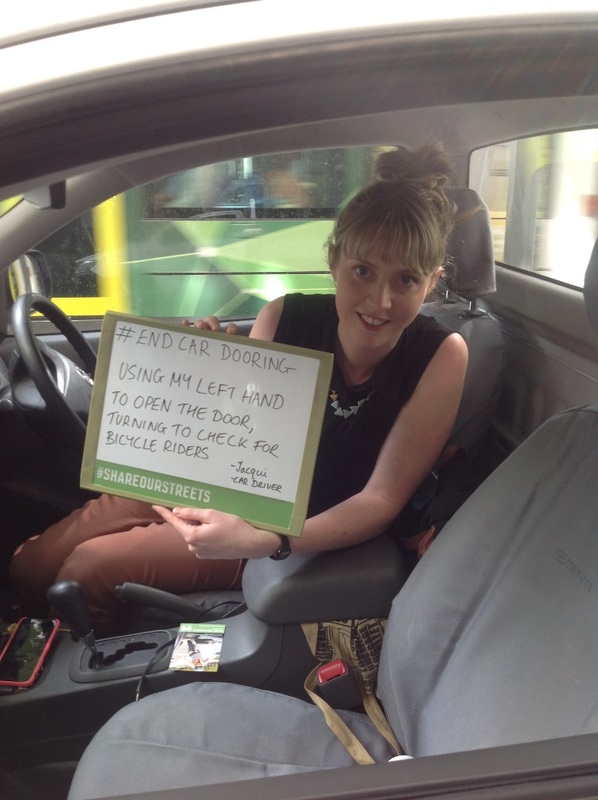 If you’re the driver, open the car door with your left hand – turning your head this way helps you to look over your shoulder to see people on bikes coming. Open your car door slowly. 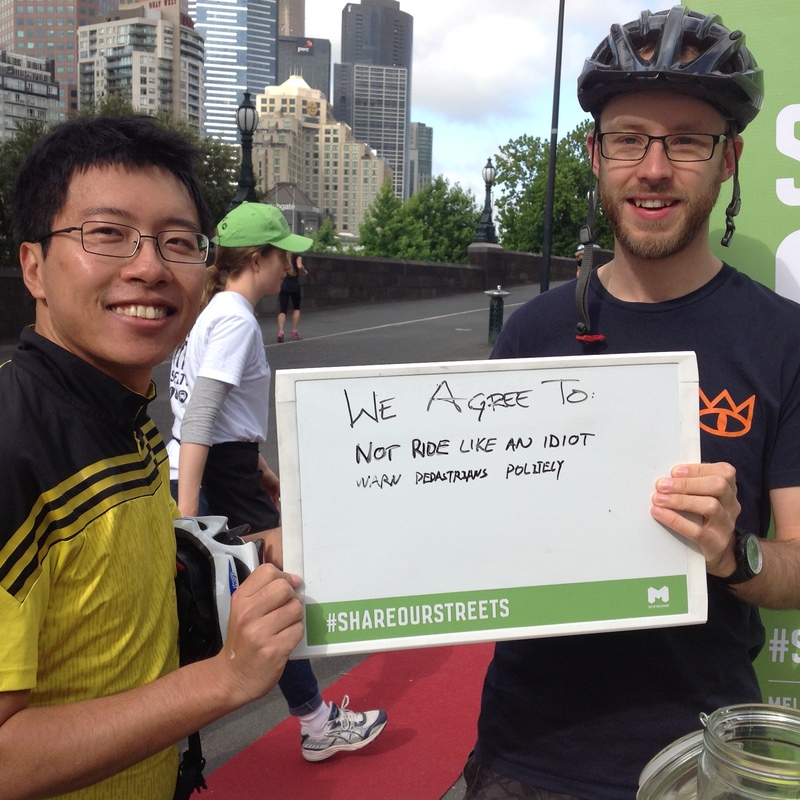 To provide further feedback on Share Our Streets or Road Safety Plan 2013-17 phone 9658 9658 or email engineering@melbourne.vic.gov.au. 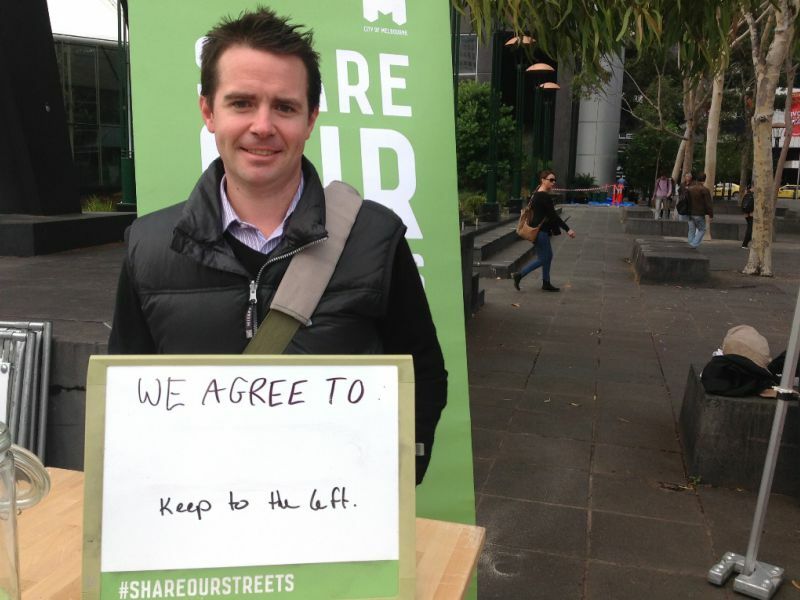 What locations are you going to target? 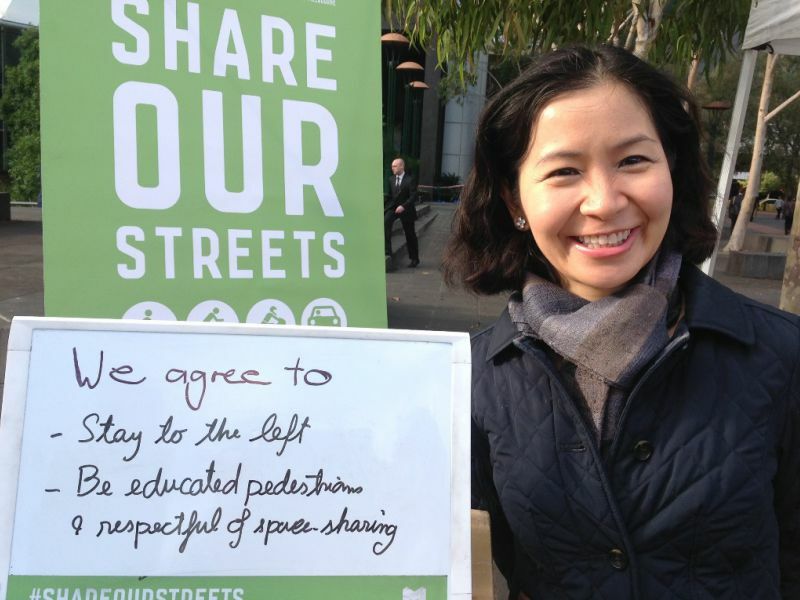 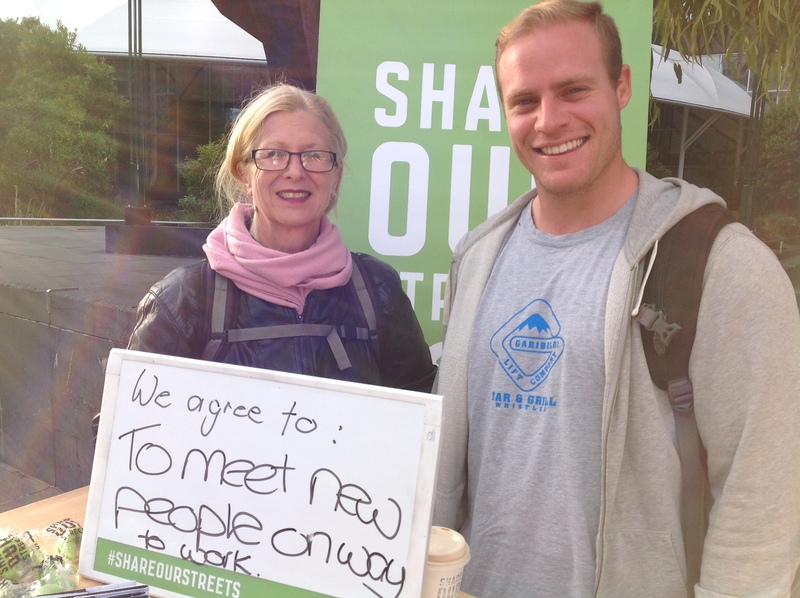 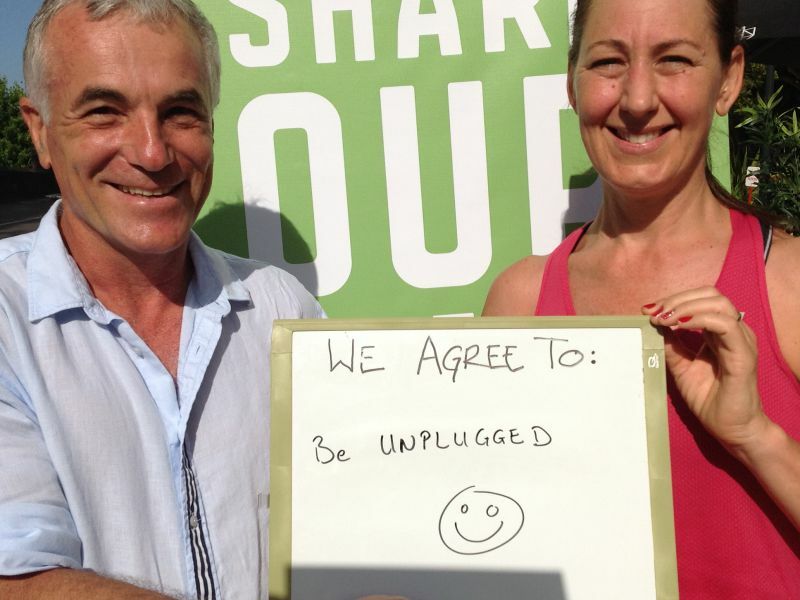 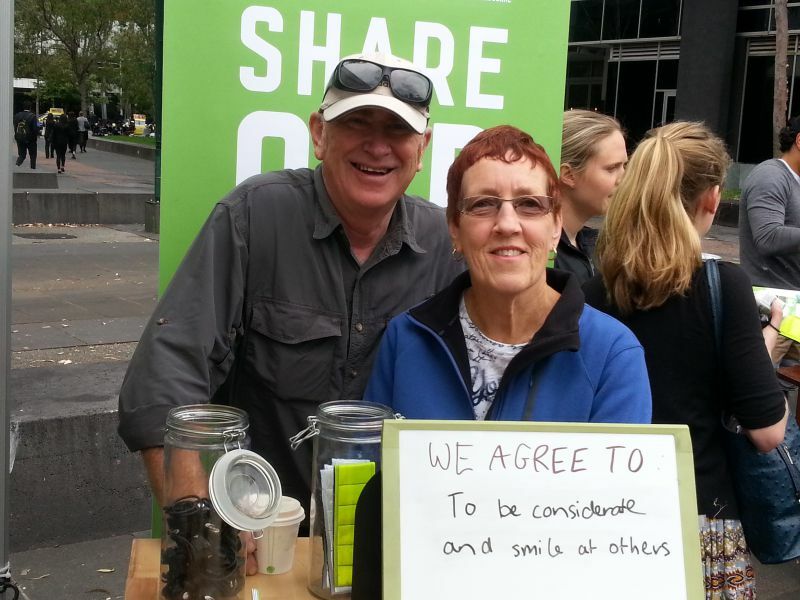 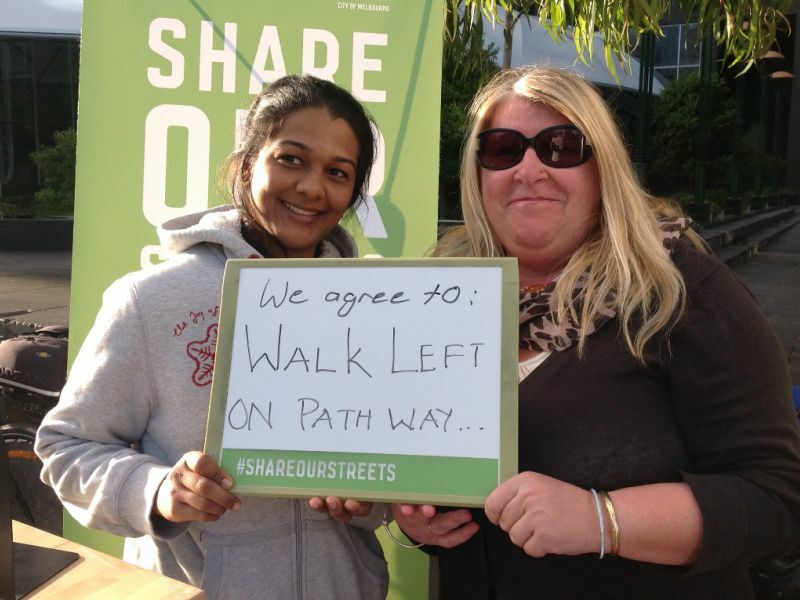 What is Share Our Streets aiming to achieve? 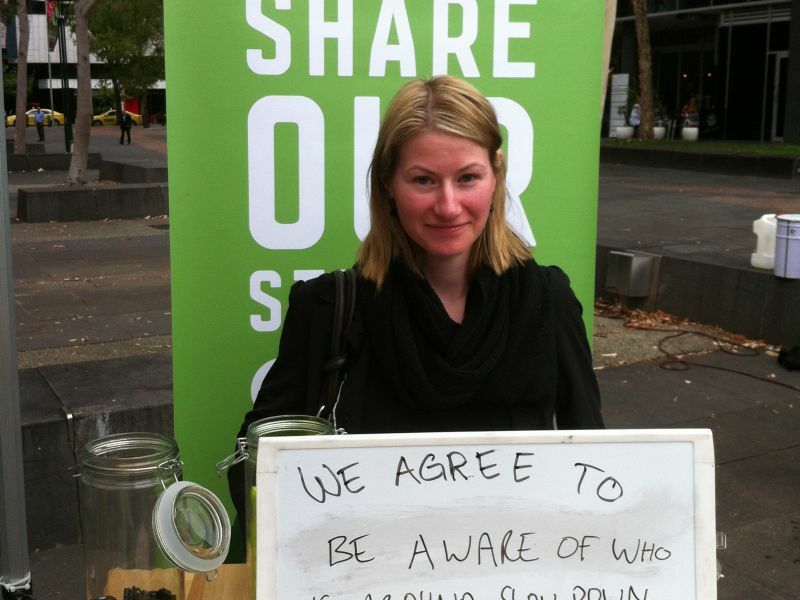 How will you know if it’s worked? What is the Road Safety Plan aiming to achieve? 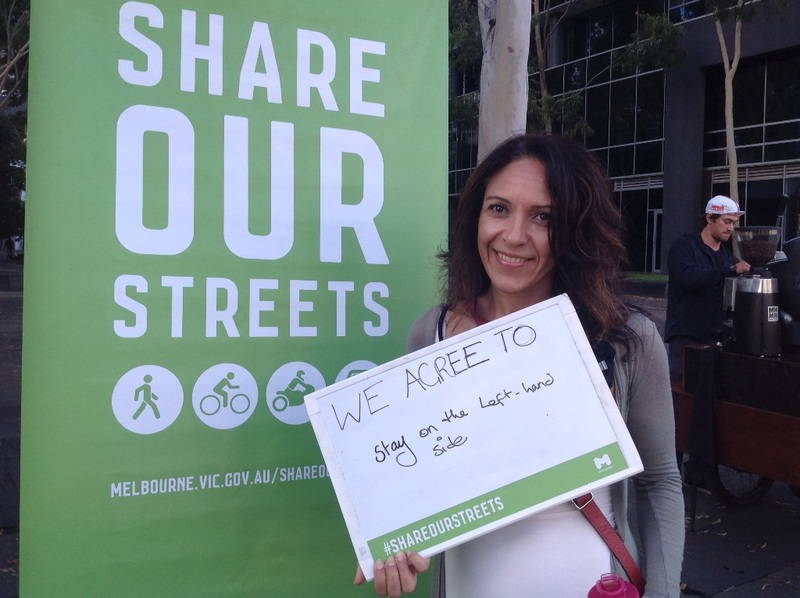 What else has City of Melbourne done to make the streets safer? 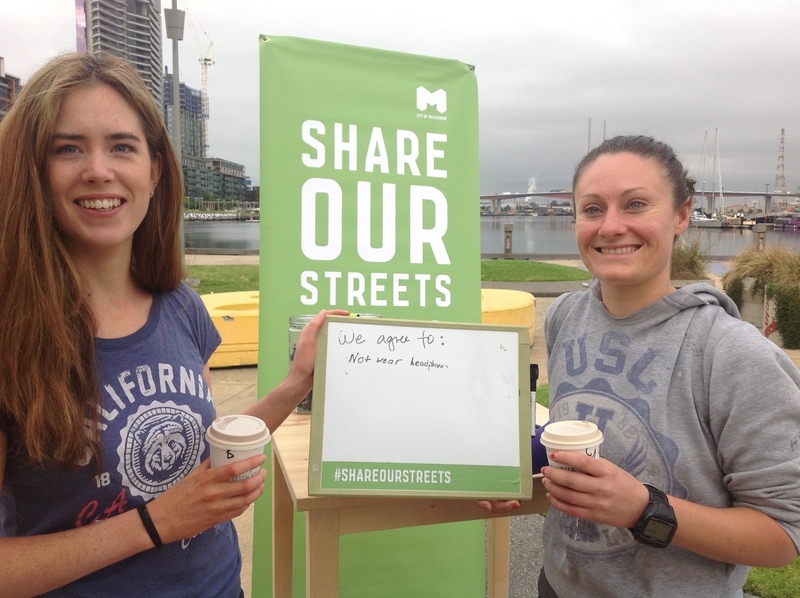 Why has City of Melbourne chosen to invest in on-street engagement activities rather than a marketing campaign? 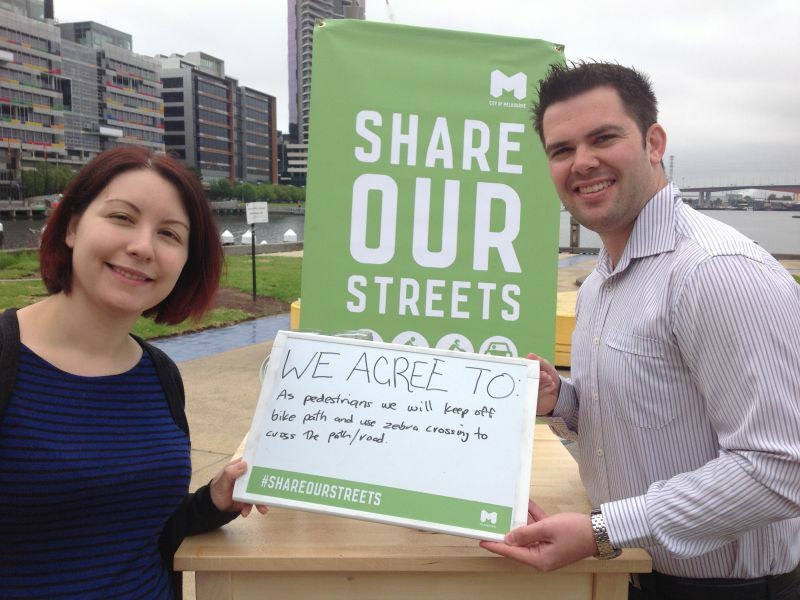 What will I see as part of the program? Share Our Streets extends the whole of City Of Melbourne, but we’ll be targeting areas with particular risks and issues including Flinders, Lonsdale and La Trobe streets, Collins Street, Southbank and St Kilda Road. ensuring all road users take care and responsibility for their actions. 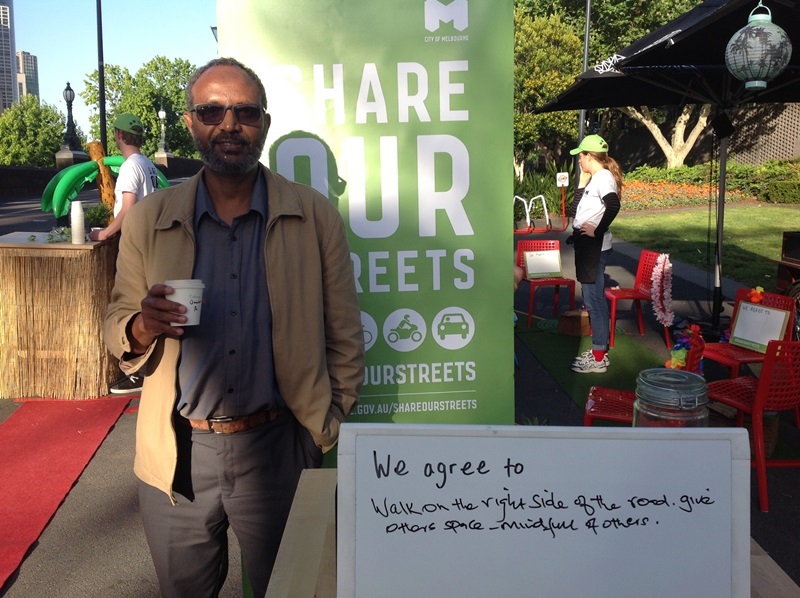 ensuring locals and visitors are aware their new road environments, so they can navigate safely through the city. Throughout the program, our street teams will be collecting data on the number of people we meet and the behaviours we observe. 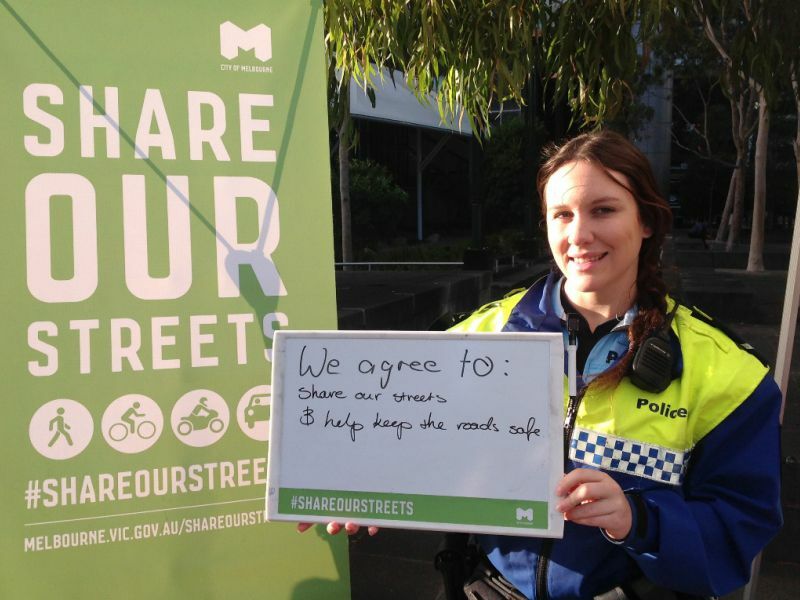 The team will also conduct a series of surveys to monitor any positive changes towards safer on-street behaviours. 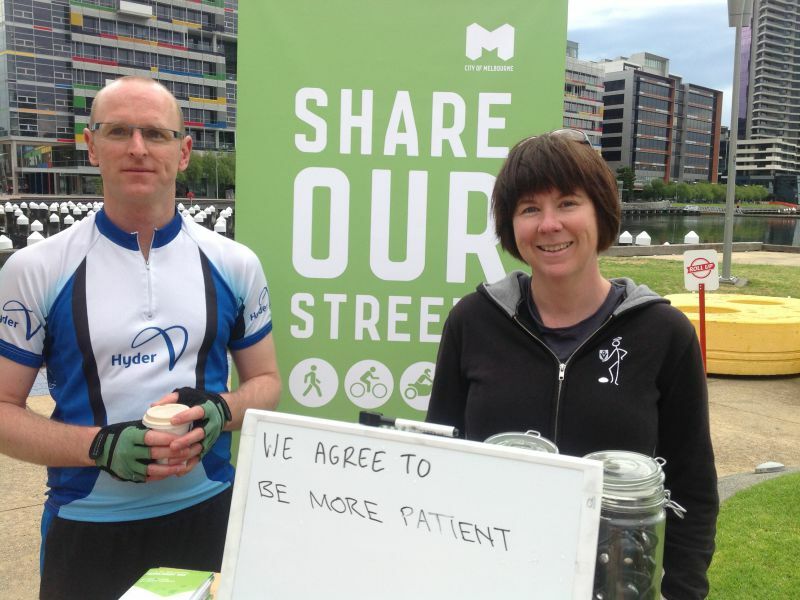 We have a long-term goal to reduce the number of serious injuries and fatalities in the City of Melbourne by 20 per cent. 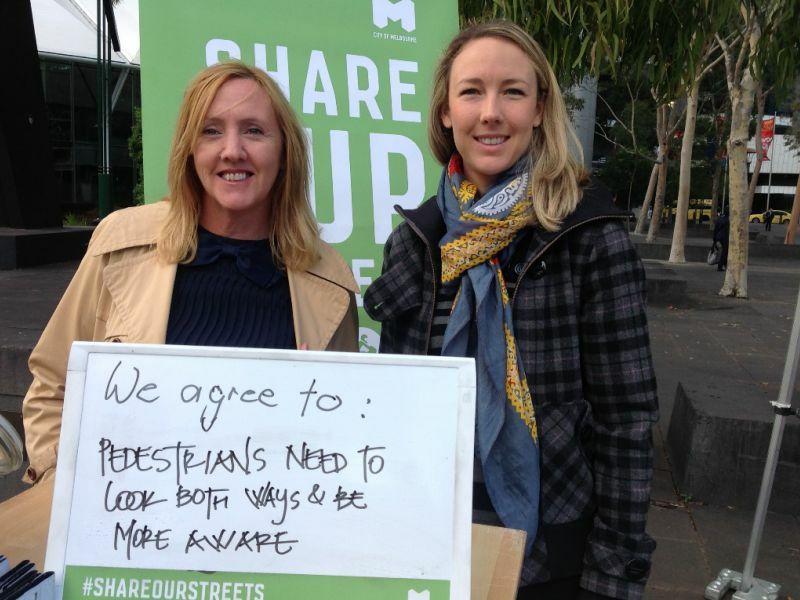 This won’t happen overnight, but will be the result of a combined effort that includes engagement with road users through programs like Share Our Streets, capital works that include footpath widening and bike lanes, improved signage, and a range of other programs. In recent years we have made a number of improvements to streetscapes across the city. 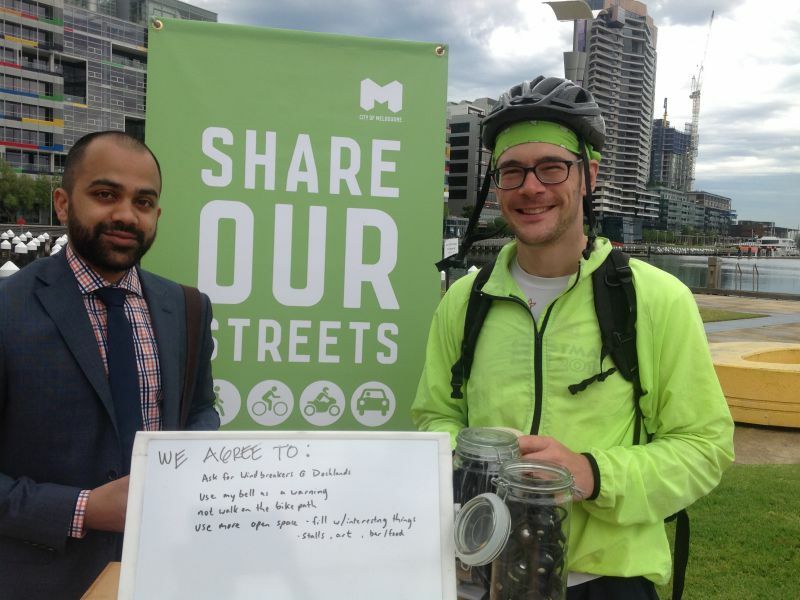 Examples include widening footpaths, reviewing the operation of traffic signals, installing dedicated bus lanes on Lonsdale Street, adding double height medians to deter people crossing the street mid-block and improving lighting at key intersections. 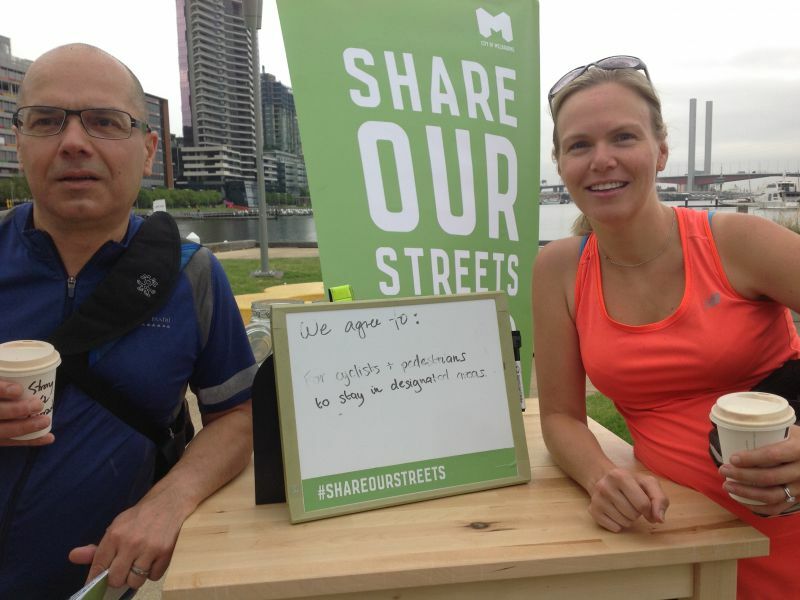 The City of Melbourne is not a road safety enforcement agency, but we are a road safety innovator. 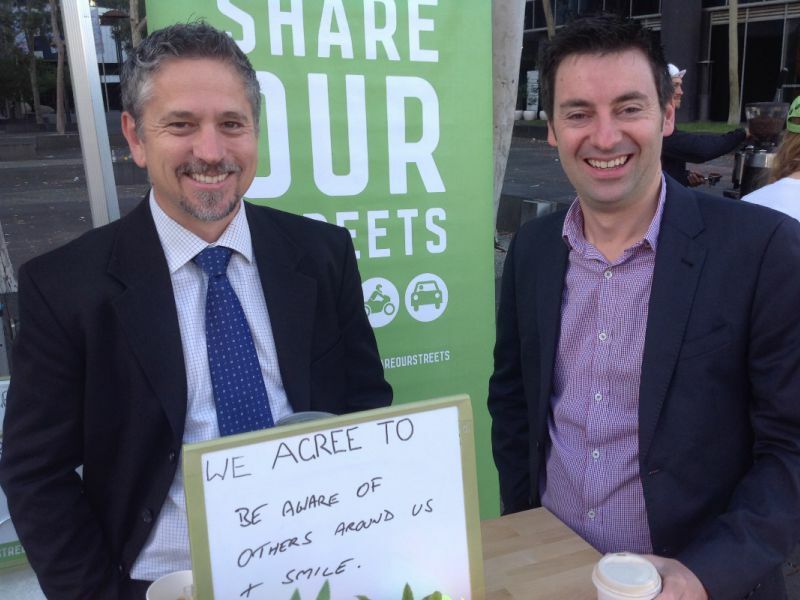 We believe Share Our Streets is an example of the role Council can play in road safety and we’re proud that we’ve spoken to so many people over the course of the program. 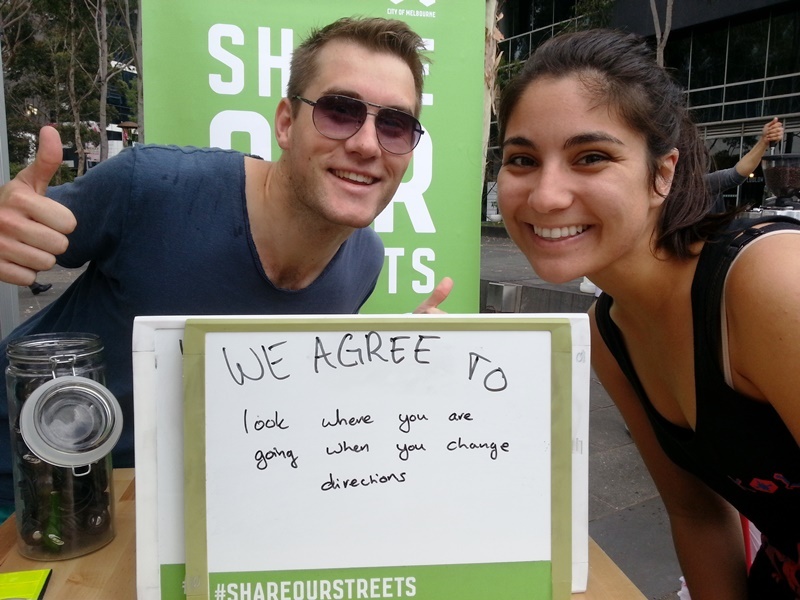 We knew from the outset of Share Our Streets that to actually change people’s behaviour we needed to get out on the street and talk to people in the locations where the behaviour we wanted to change occurs. 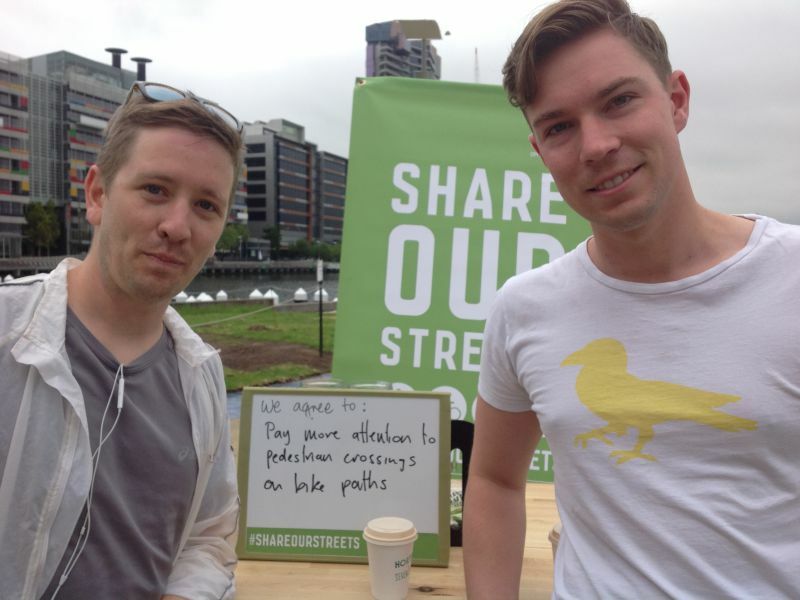 That’s why you’ve seen us chatting to cyclists and pedestrians at Southbank and in Docklands, raising awareness of distractions at some of our busiest city streets and intersections and visiting the locations with the highest instance of car-dooring in the state to speak to drivers and cyclists about the dangers an opening door can pose to cyclists. During the morning commute when people are generally rushing to work, you’ll see street teams inviting walkers and riders to slow down and have a coffee. 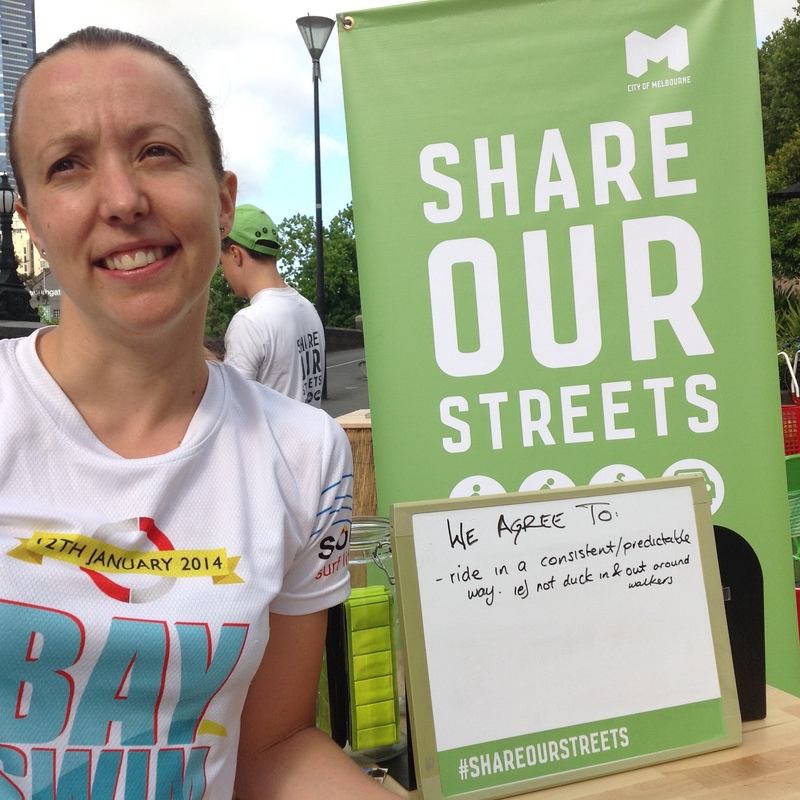 The teams will open up conversations around how walkers and riders can share the streets better. 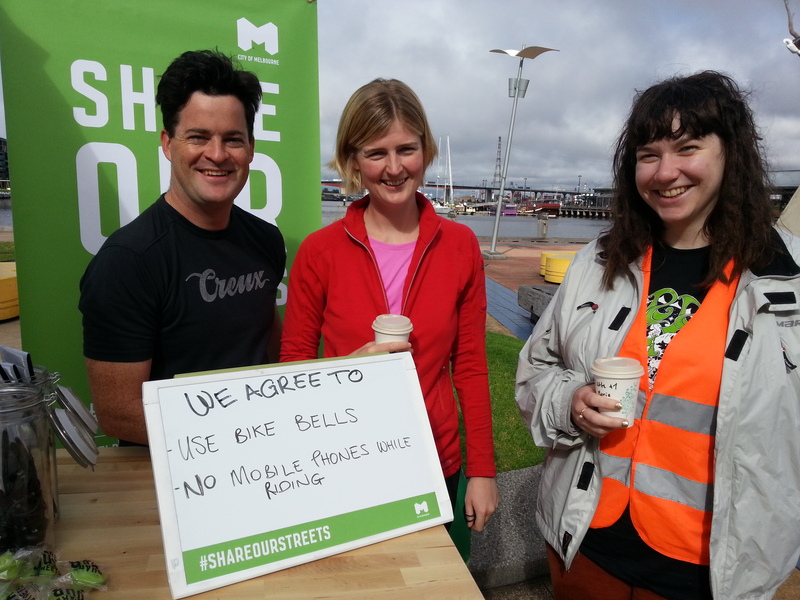 Along with coffee, the team will also hand out free tips cards, bike bells, reflectors and maps. 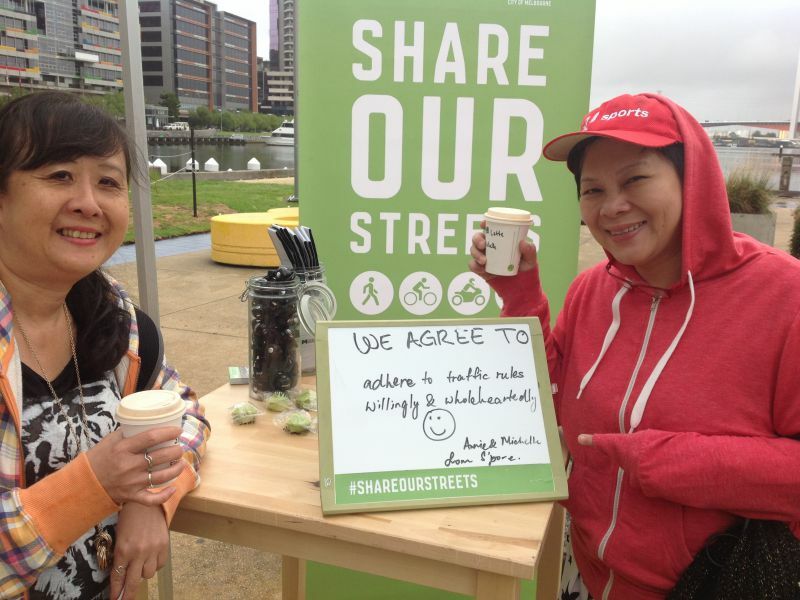 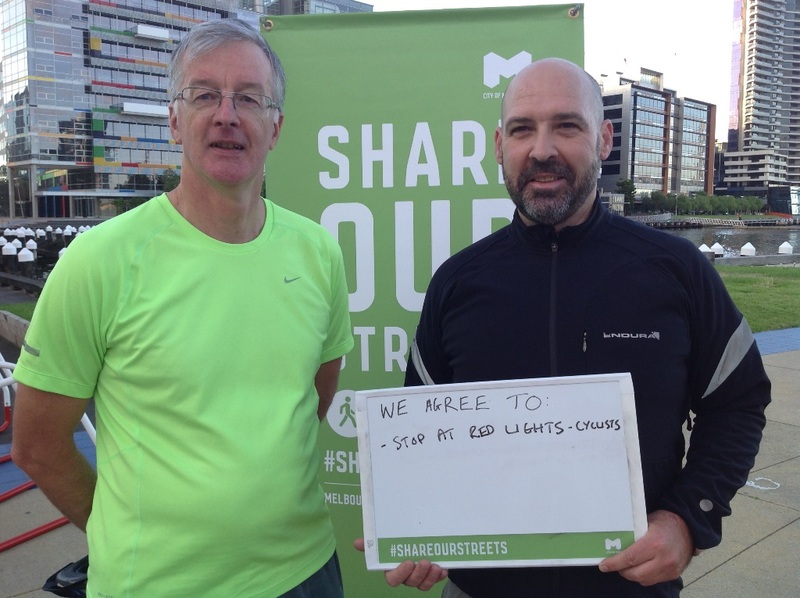 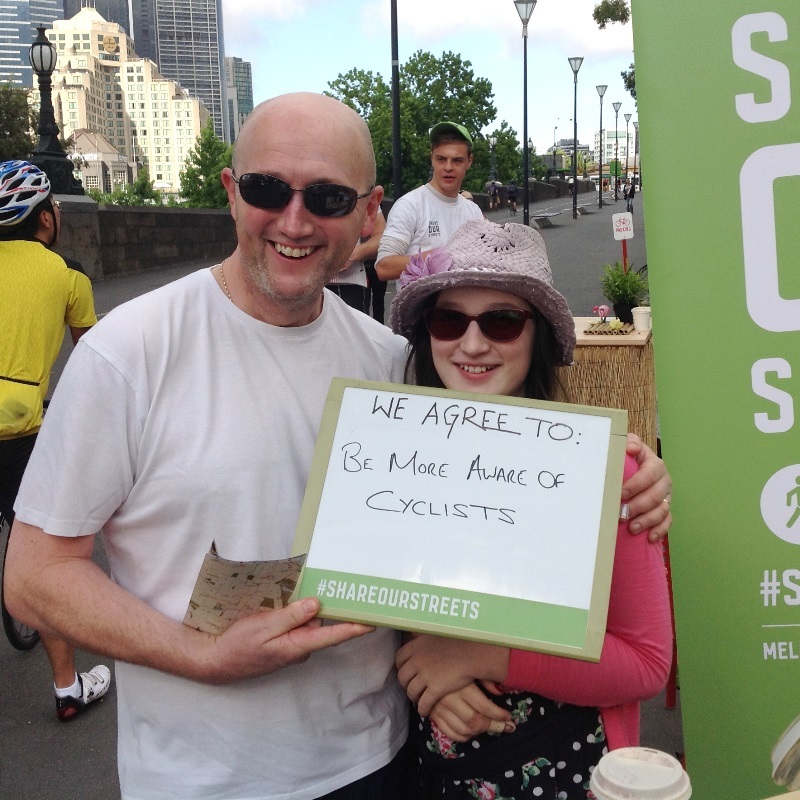 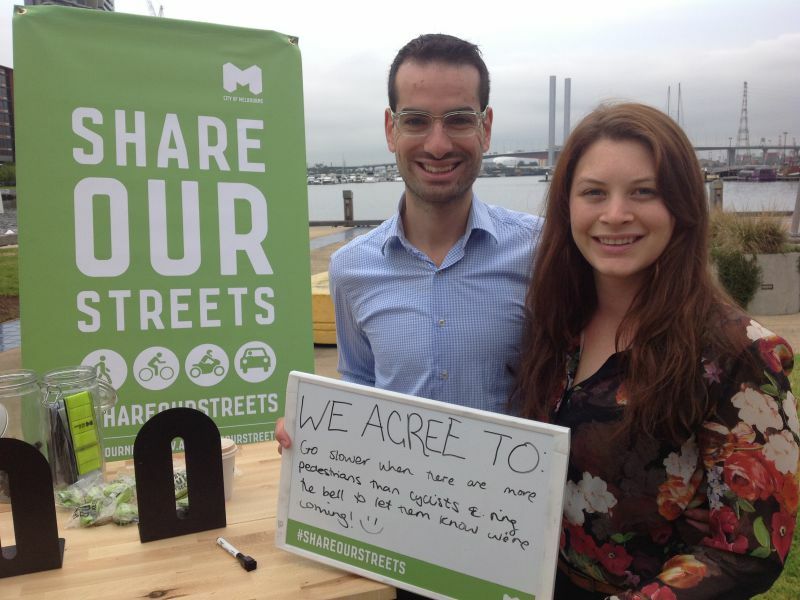 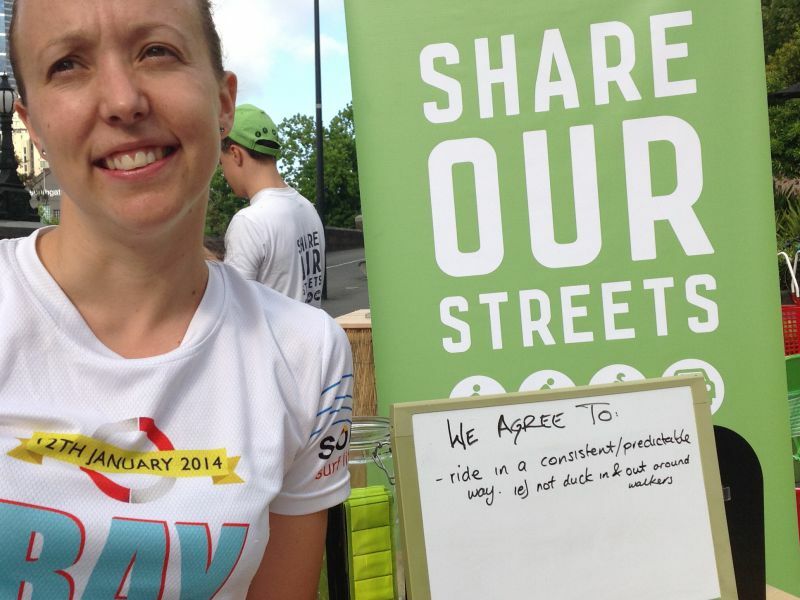 Walkers and riders can also pledge their commitment to sharing our streets and share on social media.